The Hanshin Tigers were behind the Yomiuri Giants before even stepping on the field, but the Kansai club didn’t waste any time getting even. 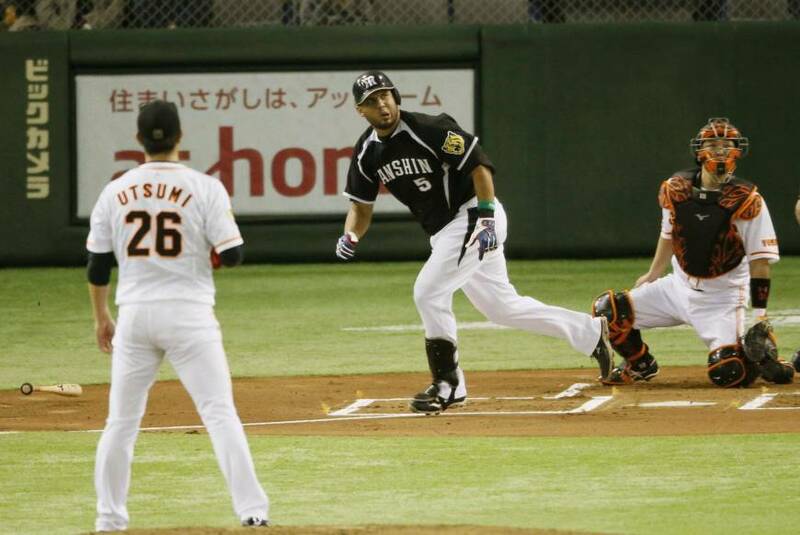 Mauro Gomez hit a two-run home run in the first inning, pitcher Shintaro Fujinami avoided a collapse in the seventh, and the Tigers opened the Central League Climax Series Final Stage with a 4-1 win over the Giants in front of a crowd of 44,871 on Wednesday night at Tokyo Dome. The Giants entered the series with an automatic one-game advantage, by virtue of winning the pennant, but things are all square at 1-1 after the Tigers’ win. Gomez hit more home runs (six) against the Giants than any other opponent during the regular season, and connected off Giants starter Tetsuya Utsumi in the first inning. He wasn’t sure it would clear the fence until Tigers fans in left field erupted. Gomez, who had 26 home runs this year, added an RBI single in the third and finished 2-for-3 with three RBIs. Takashi Toritani also drove in a run for the Tigers and finished 2-for-4. “Our third and fourth hitters got the early RBIs and set the pace for tonight’s game,” Wada said, referring to Toritani and Gomez, who combined to drive in four runs in the game’s first three innings. 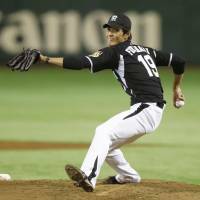 Tsuyoshi Nishioka had the other multihit night for Hanshin, ending up 2-for-5. “Nishioka had a good night and was our spark plug in this game,” Wada said. Fujinami held the Giants at arm’s length before yielding a run in the seventh and escaping a no-out, bases-loaded jam later in the frame. He threw seven innings of one-run ball, striking out six and walking one. He gave up a home run to Shinnosuke Abe to begin the seventh, which snapped a streak of 27 consecutive scoreless innings by Hanshin pitchers to begin the postseason. The right-hander then allowed three consecutive singles to load the bases. He caught a break when pinch hitter Frederich Cepeda hit into a 3-2-3 double play and retired another pinch hitter, Hirokazu Ibata, to end the inning. “I may have been running out of gas in the seventh, but the manager stuck with me, so I gave it all I had,” Fujinami said. He picked up the win after losing both of his starts against the Giants during the regular season. “It feels really good to get my first win over the Giants this year, especially in such a big game,” Fujinami said. The Tigers still face a somewhat uphill battle to the Japan Series with every remaining game of the series scheduled for Tokyo Dome, where Hanshin was 5-7 against the Kyojin during the regular season. Utsumi had a largely ineffective outing, serving up a number of hittable balls to Hanshin batters. Utsumi allowed four runs on nine hits over 6⅔ innings in the loss. He struck out two and walked three. After scoring just one run in their two first-stage games, a 1-0 win and 0-0 tie against the Hiroshima Carp, the Tigers roared in a three-run first inning in the final stage opener. Nishoka led off the game with a single and advanced on a groundout by Hiroki Uemoto. Toritani got the scoring started with an RBI double, and Gomez followed with his homer into the throng of Tigers fans beyond the wall in left field. “At Koshien, we were only able to get one run in two games, so it was nice to see us score and get the lead in the first inning tonight,” Wada said. Uemoto walked to begin the third, and Toritani singled to put two on with no outs. Gomez made the score 4-0 with a single to right, but Utsumi kept the damage to a minimum despite loading the bases with none out later in the frame. The teams will reconvene at the Big Egg on Thursday night, with the first pitch of Game 2 scheduled for 6 p.m.